Stamp a Blessing: Wild about Flowers by Stampin'Up! 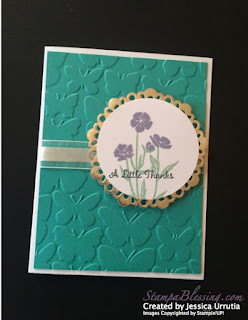 Wild about Flowers by Stampin'Up! Did you see my last card with Wild about Flowers….ok, stop and scroll down. Because you WILL love this set and the rich colors. 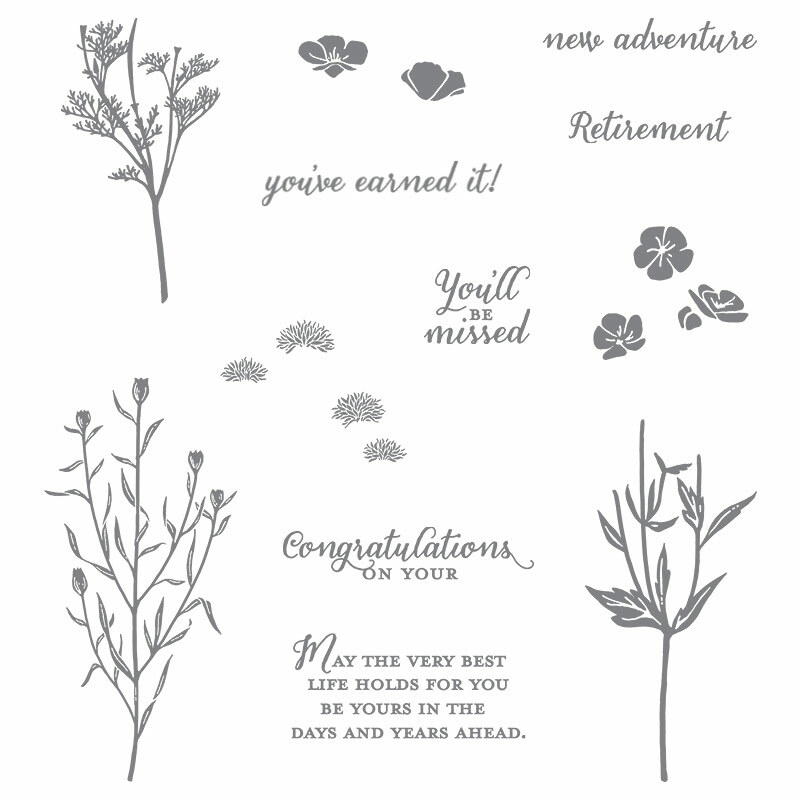 Since this stamp set came out I've been more observant of the beauty of wild flowers. Interesting! 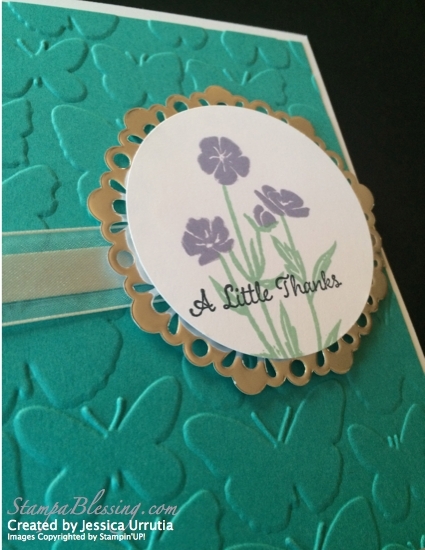 Now check this card we made last Saturday at my Monthly Cool Card Class. My ladies were able to make one of these in gold and then one in silver. These Metallic Doillies are my favorite embellishment in the new Catalog. *Cut Whisper White CS at 5 1/2" x 8 1/2", then score at 4 1/4". *Cut a layer of Bermuda Bay at 4" x 5 1/4". 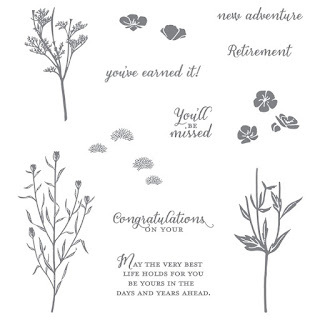 *Emboss with your Big Shot and the Fluttering Texture Embossing Folder CUTE! *Cut a 7" piece of Gold ribbon or white ribbon and tape around your layer on the back. *Stamp your Wild about Flowers stem with Mint Macaron Ink. *Then stamp your flower in either Perfect Plum or Hello Honey. *Stamp the "a Little Thanks" sentiment from One Big Meaning with Memento Black Ink. *Punch your circle with the 2 1/2" circle punch. *Adhere circle to doily with dimensionals. *Adhere metallic doily to BB layer with dimensionals. 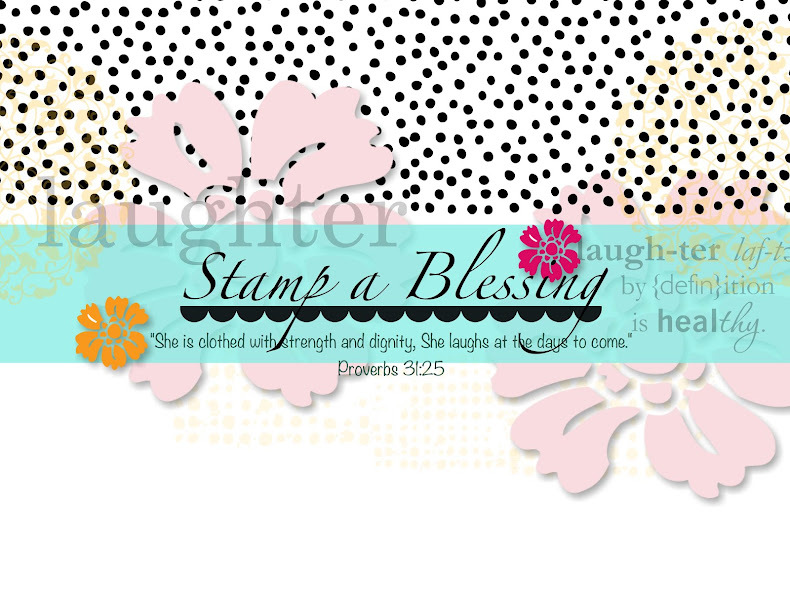 You still are on time to sign for my Stamp a Blessing Retreat! I sent an email yesterday to all my current customers with three different options on classes. More information on this on my next email. Those who participated on my last shoe box swap can tell what a fun idea it is. Join today! 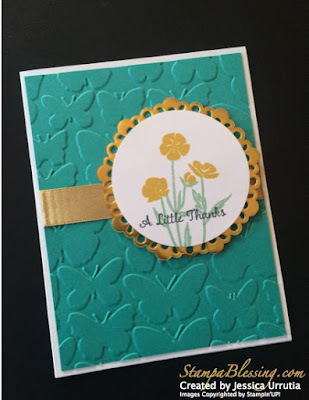 ​Create 8 different HAPPY Holidays Cards trying new product from the Holiday Catalog…learn simple tricks to make your card making quick and easy! We will make 2 each of 4 different designs. :) Sign today! This is a Product Based class. 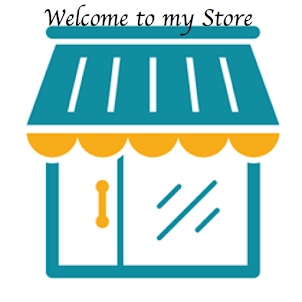 You will receive product to take home with you. I CanNOT wait to show you all these new fun techniques I am learning! Don't miss it! All of my technique classes have been full and exciting in the last months. ​SIGN UP for retreat today! I am working every day on this super awesome event. It will be my best event of the year!! You got to be here! Creative Blessings to inspire your city! Are you ready? Get Well! Did you know….there is a new punch? 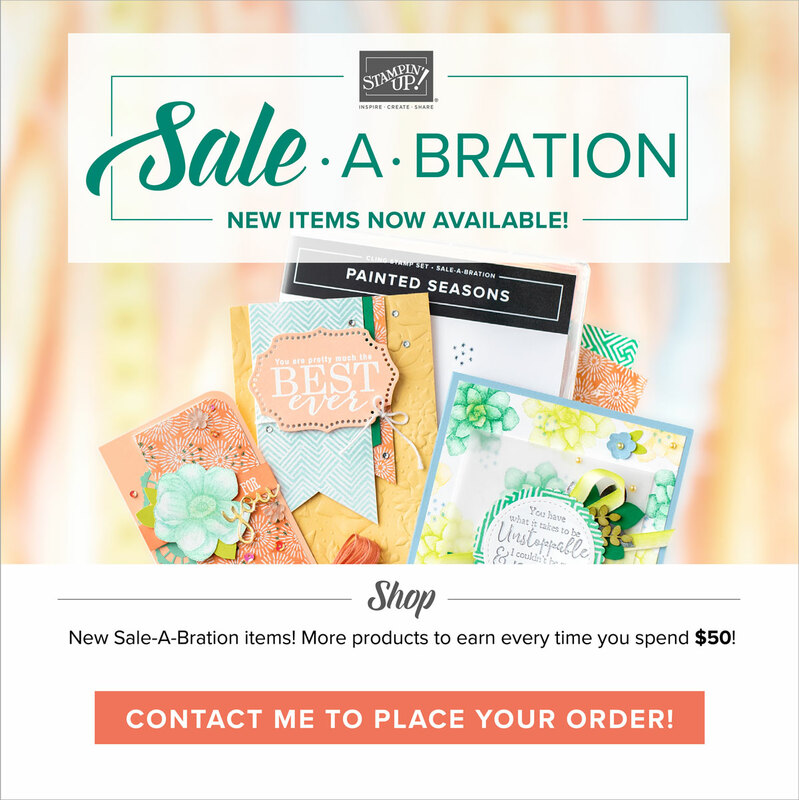 All Boxed Up Kit by Stampin'Up! 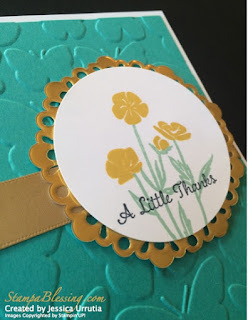 Happy Notes by Stampin' Up! Stamp a Blessing Retreat is Here!